Our hosting packages are designed to provide you the peace of mind of knowing your website is hosted on a server with high levels of security, speed and reliability. Our integrated website service allows us to identify and manage the best hosting package for the website we would have developed for you. 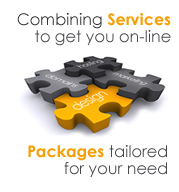 The packages below can be tailored to remove or include extra features as your needs change over time. Normally our clients websites are hosted on 'Shared' server where their website sits along side the websites of our other clients. Importantly, keeping the shared server for the exclusive use of our own clients helps us maintain a problem free shared environment for your website. We can also set up a 'Dedicated' server (exclusive use) for clients who have very demanding requirements or multiple websites. There has been quite a lot of coverage in the the media about 'cloud computing' reporting on the growing potential to run & store programs & data using remote services accessed over the Internet instead of your local computer. 'Cloud hosting' services describe a hosting environment spread over a number of servers. While this potentially offers advantages in scaleability etc, currently cloud computing is a relatively new approach the limitations of which have been exposed in some high profile failures. Consequently we don't offer cloud hosting services to clients at this present time. Our main servers are now housed in a secure data centre in the London area (for security reasons we do not wish to identify the exact location). We employ consultants based in the same area to physically manage the actual servers but we are able to manage most aspects of the servers remotely. We still have a small data centre at our Bargoed office but this is now only used for network services and website development. Our packages provide you with the ability to manage useful hosting features such as e-mail accounts & forwarders via a control panel. Perhaps you already have hosting provider? Where necessary we can work with any reliable provider who supports the scripting and other requirements we'll employ to develop your website. For more complex sites this might include MySQL databases, PHP, Perl and a user-writable CGI bin.